There was the inevitable announcement that came, still Mr. Market did not take that kindly, the stock is down over three percent in the aftermarket. Starbucks Announces New Leadership Structure to Drive Next Wave of Global Growth. Howard Schultz is handing over the baton to Kevin Johnson, who is currently the Chief Operating Officer of Starbucks. Schultz will move his role to executive chairman. His main aim now will be to "focus on retail innovation and accelerating growth of Starbucks ultra-premium retail formats." What does that mean? Well, more stores like the roastery, where coffee becomes a destination and the improvement of consumer experiences. 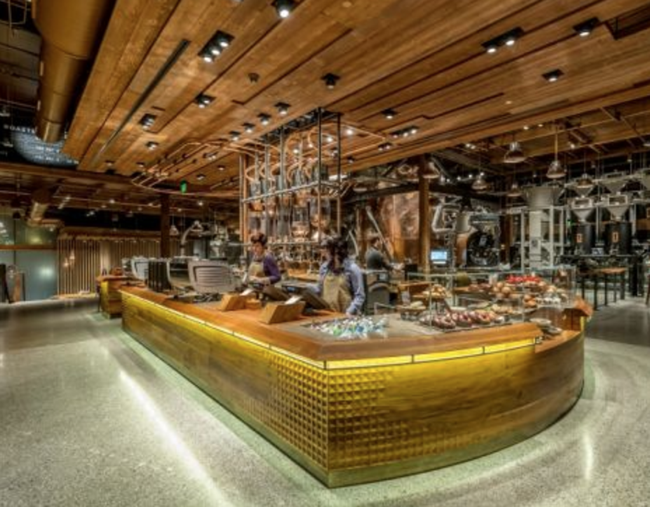 Check out a picture of the roastery from the Starbucks website, the first of which was debuted two years ago in Seattle. You have to remind yourself at some level that the experience of coffee, coffee drinking and coffee culture are both centuries old as well as very new. The plan to roll these out is calculated and clearly takes a lot of homework, as well as huge expense. Schultz is not going places other than the company, fulfilling a role that he enjoys more, and as such, shareholders are bound to get the very best out of him. Onto the successor, Kevin Johnson, who will assume the role in April next year. He has a huge technology background, having spent 16 years at Microsoft and 5 years at Juniper (smaller competitor to Cisco), both hardware and software. What is equally astonishing is the "legacy" that Schultz has created, and must hand over to Johnson. 300 thousand employees who wear the green apron, and as Bright pointed out via a Motley Fool Tweet: "Since Howard Schultz brought @Starbucks public in 1992, the stock is up over 170 times in value. That's north of 23% yearly returns. Wow" The space between is for effect. Great brand, great company, huge global presence (25 thousand stores) and in good hands. Our view is unchanged since we covered the results in early November - FY numbers, store rollout continues, in which we concluded "We continue to accumulate one of the best brands and consumer stocks globally."